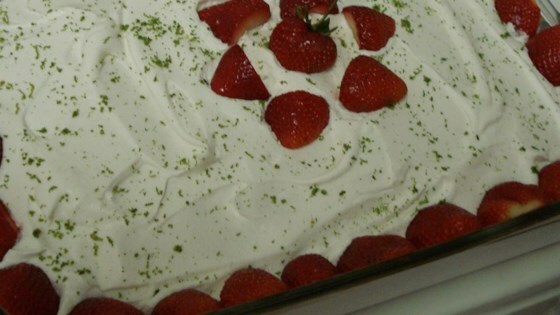 "Strawberry margarita mix and lime zest make this cake as refreshing as the cocktail. Served straight from the fridge, it's the perfect summer treat." In a large bowl, stir together cake mix, egg whites, oil, water and margarita mix. Pour batter into prepared pan. Bake in the preheated oven for 25 minutes, or until a toothpick inserted into the center of the cake comes out clean. Allow to cool. Stir lime zest into the Cool Whip(R). Frost cooled cake and refrigerate until serving. I use applesauce instead of oil and this makes the cake very moist. This cake is requested often and I never have any leftovers!! This was excellent! I tweaked mine a bit and added 1 tbs. lime juice to the water and it was a very nice blend! also made cupcakes instead of cake.